I have been spending my sewing time lately focused on the details for the workshop in October. Even though the project that day involves log cabin diamonds, the workshop will also feature a trunk show of various other things you can do with diamonds, starting with a simple one patch design and progressing through more complicated isometric perspective pieces. The teacher in me loves this part of the planning. I finally settled on this arrangement, and added an outer border as well. 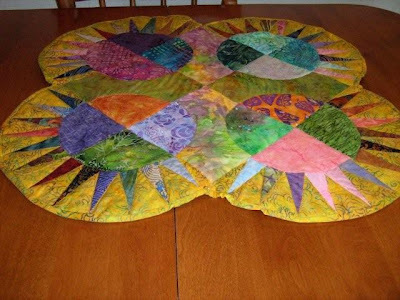 If you are interested in joining this fun workshop which is being organized by the Cumberland Quilt Guild, there are still a couple of spots left in the Wednesday, October 14th one. You are welcome to email me or Carol Chapman for more information. Two good news items for today: the first is that Amherst won the challenge yesterday - yea! My youngest son is amused to hear the TSN announcers pronounce the name of our town, emphasising the "h". Vernacularly, the "h" is silent. If you click on the voteamherst.ca link, you can see the winners from the other days of voting, and also the current competitors. Exciting news! 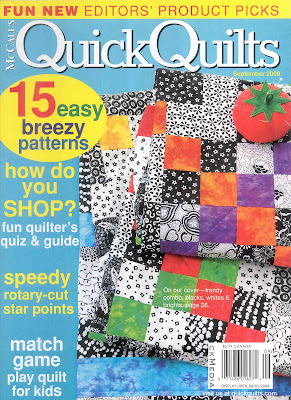 Equally exciting is that the September issue of McCall's Quick Quilts is on the stands, and editor Beth Hayes has included mention of our book, Canadian Heritage Quilting. Check out page 59. There's big excitement in our town today as each of us has the opportunity to help Amherst, N.S. in a very unique way. Please take a moment to click this link to read about the contest, and then cast your vote for Amherst! But hurry - it all ends at 1 pm today. If you are thinking of joining us, please reserve your spot now as this will fill quickly. We are just back from Prince Edward Island, where we re-visited MacAusland's Woolen Mills. The mill is located in Bloomfield, which is a very short drive from Summerside. 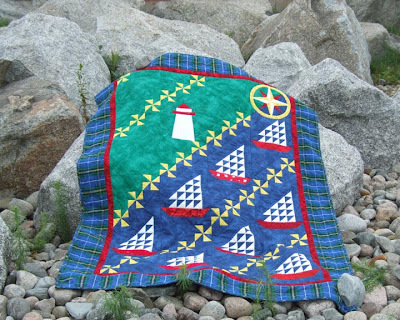 Many of us in the Maritimes grew up with a MacAusland woolen blanket on our bed - a tradition which continues in our household. In fact, we received one for a wedding gift 25 years ago. When the boys were born, we purchased MacAusland "lap sized" blankets, which saw use first on their cribs and are now pressed into service as throws on the couch. I love going to this mill, and they happily welcome visitors. The smell of the old wooden building is of particular appeal. The raw wool is heaped in a big pile just inside the door and looks as soft as feathers. I wonder how many people over the years have jumped into this pile? I know I wanted to! The raw wool is carded and spun on big machines. It's a treat to pick up these wooden spindles and feel the lanolin from the wool on your hands. ...and some is spun into yarn. The yarn is dyed into the most glorious colours. I didn't count all the different shades available on the colour card, but there are quite a few. I chose some 2 ply sock yarn, in a purple heather shade. These socks will be for me, and I look forward to knitting them over the winter months. From Bloomfield, it was a very short jaunt into O'Leary where we visited the Quilt Gallery of P.E.I. Adrienne's huge and gorgeously displayed shop is such a treat, as anyone who has visited surely knows; you can find just about everything there. I purchased some Christmas fabrics, and also a refill for my chaco-liner. 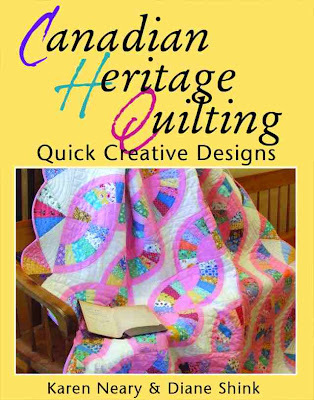 While there I signed copies of Canadian Heritage Quilting, so if you are in the area you will be able to find signed copies in this shop. 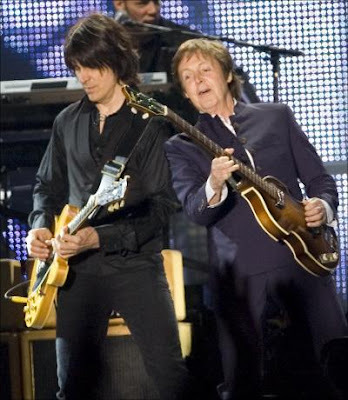 "Got to Get You Outta My Life"
I have to wonder if anyone reading this blog is actually a quilter, since all the emails I have received in the past little bit have either been about bees or Paul McCartney! Since so many have asked about the concert, I decided I had best post some details of this absolutely wonderful day. I wore the Tshirt from the Quebec 400 concert last July. This is the first time I have worn the shirt. It was a great choice, as so many folks throughout the day came over and showed me theirs from this event also - classmates, I guess this makes us...McCartney alumni. A friendlier, warmer bunch there could not be. Amazingly, we found a parking spot very close to the Commons. We arrived around 3 pm, and left well after 1 am (that late as one of of our group got lost and we had to wait for her ...some people, huh?) The parking cost us $4.00 - what a bargain! We walked along some of Halifax's beautiful tree lined streets enroute to the concert. 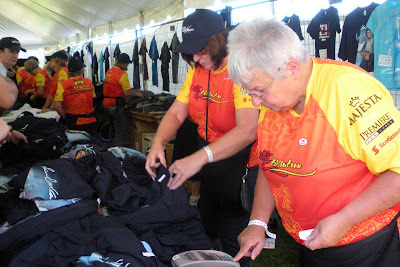 Learning from last year's sell-out experience, my first stop inside the gates was at the merchandise tent. There were many styles, colours and sizes from which to choose. The crowd was large but moving quickly as we headed onto the grounds to claim our spot. We made note of the landscape and decided if the group got separated we would meet up afterwards at the kiosk which read "Tickets, Tickets, Tickets." Rules allowed folks to bring a fold-in-a-bag chair and there was a special section where those chairs could go. We got set up and began the wait. It didn't take terribly long for me to get antsy and decide I wanted to be closer to the action...so I ditched the rest of the group and elbowed my way forward all alone. I ended up about 11 rows from the front of the stage. It was a perfect spot to watch what was to be a perfect concert. Joel Plaskett warmed the audience up for Paul, and what an entertainer he is. Even though playing for a crowd that size must have been daunting, he appeared totally comfortable and in his element. No wonder Paul hand picked him to open. Way to go Joel - you did us proud! We loved his set. There were many highlights to Paul's performance; for me, it was a very moving moment when the 78th Regiment Pipe and Drum Corp joined Paul onstage for a rousing version of Mull of Kintyre. 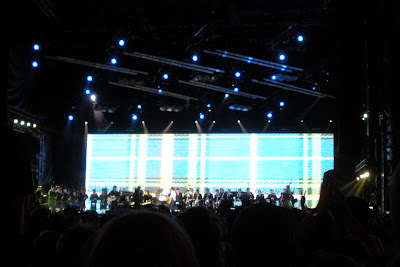 I loved that the backdrop projected across that huge stage was our Nova Scotia tartan. It was very cool to hear Day Tripper performed, as we understand that one has not been done live since the Candlestick Park concert of August 1966. The pyrotechnics employed during Lie and Let Die were also very dramatic, although admittedly having seen them last year in Quebec made them rather expected. Spectacular none the less, and they were larger in Halifax than in Quebec. Everyone loves the part with the fireworks! 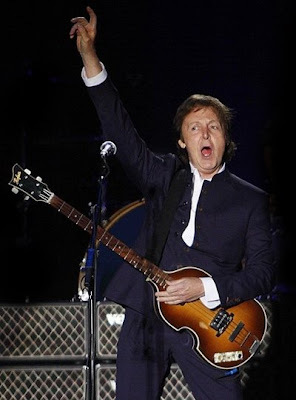 Paul arrived on stage at 9:20 and sang non-stop until almost midnight, giving two generous encores. His energy is amazing and his musical talent unsurpassed. It was a beautiful moonlit night, and the concert could not have been more perfect. We look forward to reliving the moment via the DVD which will be released shortly. Since there was not enough time to handquilt the entire piece, I decided to do a combination of machine and handquilting. 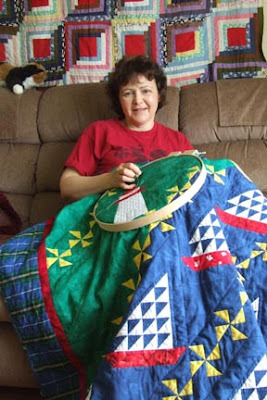 Details throughout the body of the quilt, as well as a cable design in the border, were all added with hand stitches. Hidden amongst the waves under the ships are an octopus in his garden, and a yellow submarine. This new chaco-liner worked great to mark the design on the dark fabrics. It has a little wheel inside which ran very smoothly. 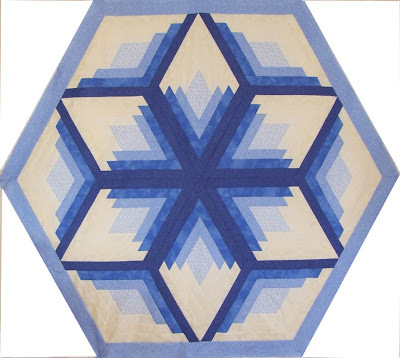 It was such fun to work on this quilt, knowing where it was destined. Quilted in the inner red border are the lines from the song which give the quilt its name, as well as the date and occasion. Hubby came with me on the weekend over to the welcome centre at the entry to Nova Scotia to help with the photo shoot. Our first trip over was rained out - the heavens opened just as we got the quilt spread on the rocks - so we gathered everything up and ran. Our attempt on the following day was a bit more successful, despite a very high wind. We finally weighted the edges of the quilt down with some of the big rocks. 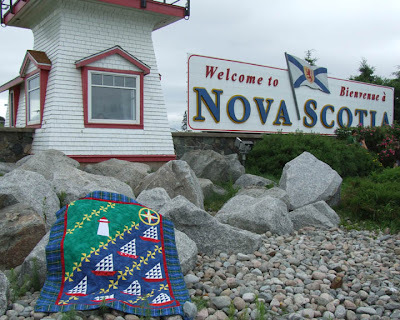 The picture below with the "Welcome To Nova Scotia" sign was used on the front of the card which accompanied the quilt (and a hand-written note to Paul). Day before yesterday, it was couriered to the promoter (Harold MacKay) in Halifax, who had already checked all of this out with Paul's people to make sure it could happen. It is a thrill to know that the quilt will be presented to Sir Paul McCartney early this afternoon, right before he does the sound check on the stage in Halifax. Sincere thanks to Michele and Harold MacKay for their help. Tomorrow is concert day, and we are having sunshine. It doesn't get any better than this! There's never a dull moment around here! 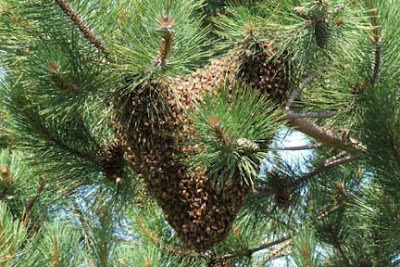 Yesterday enroute to checking the bees, by sheer chance hubby spotted a swarm in a grove of nearby pine trees. Luckily, I had the little Nikon in my pocket and got a quick shot before we headed home for swarm gear. As you can see, originally the bees were clustered in two groups: When we returned with boxes and a ladder to aid in their capture - and a bigger camera! 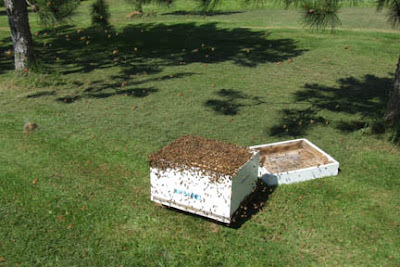 - the bees had moved together into one huge clump. 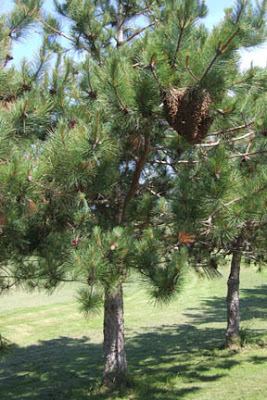 From a distance, it looks like a giant pine cone. 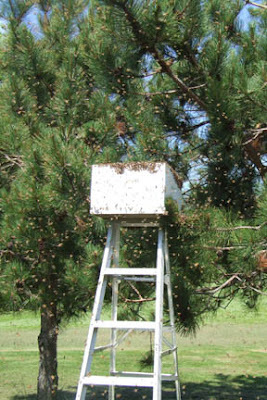 Conveniently, the tree was not a very tall one so it was easy to reach the swarm. Hubby put a step ladder in place with a box of frames just underneath. He climbed up and gave the branch a shake, hoping to dislodge the swarm into the hive. 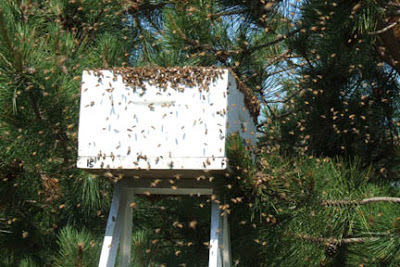 It's a very dramatic moment when all those bees are buzzing through the air, but the strategy worked and they soon settled into the box. 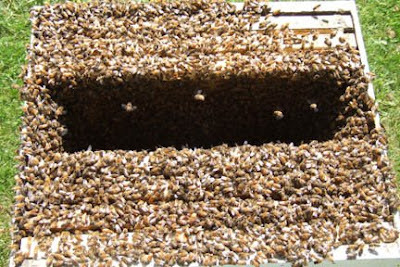 Look how many bees there are! We waited until they settled a bit, and then located the queen. We returned early evening to add a few items to make their housekeeping easier, and will check on them again to ensure all is well. 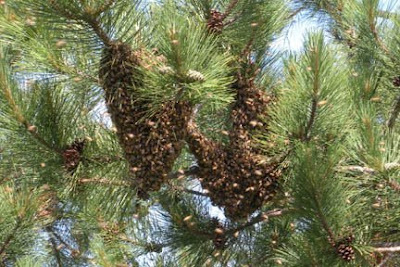 This is the most swarms we have ever captured in one season, and even though the old adage tells us a "swarm in July isn't worth a fly", we'd like to think the precious honeybees are happy to have a new home provided so easily. 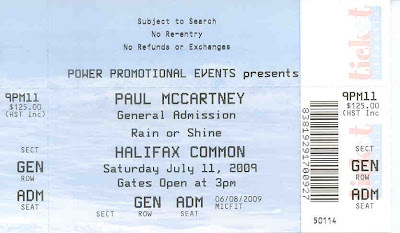 Saturday, July 11th will be a big day in Atlantic Canada...for many reasons besides Paul McCartney's concert! Not the least of these will be the first annual Atlantic Author's Day which will have authors from around the Maritimes making guest appearances at bookstores. Look for me at Coles in the Amherst Centre Mall from 10 - 11 am that day. 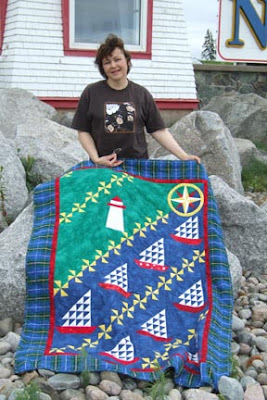 Diane Shink, fellow co-author of Canadian Heritage Quilting, will be at Frog Hollow Books in Halifax from 1-2 pm. The complete schedule for the province of Nova Scotia is posted here. The schedule worked out great, as it allows me ample time to get to Paul's concert following the signing! Don't you love surprises? I sure do, and it was certainly a surprise to open my mail to find this picture of a gorgeous Maritime Beauty centrepiece. Carolyn has used a great many colours to good effect - I love how warm and cheery this looks! What a terrific job with all those sharp points. Stay tuned for another from Carolyn - the next maybe in Christmas prints? - who was part of the class in Keswick Ridge back in April. Thanks so much for sharing this, Carolyn. C'mon Lucy and Christine, and all you others from that day- we're still waiting to see yours!